Family is basically a group of blood-related people (sometimes non-blood relations are also a part of the family for example spouse, in – laws and friends) who accepts us for who we are, who would do almost anything to make us smile and who would love us no matter what may happen. Ultimately family is the only place where our life begins and love never ends. Family may be classified into the closed family and an extended family. The close family includes our parents, siblings, and spouse and the extended family includes in – laws, uncles, aunts, cousins and so on. Sometimes even close friends are a part of the family. 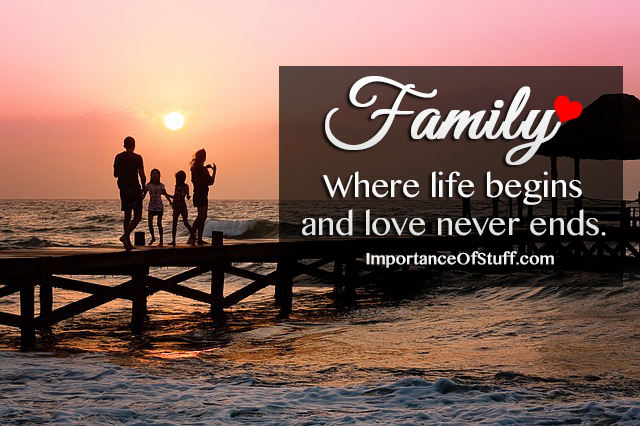 Without a family, it becomes extremely difficult to live in this big world and hence a family is of prime importance. First and foremost, a family is always there for our support and security. Whenever there are any kinds of problems in our life whether it is going for a job interview or a bad performance in an examination or getting over a breakup, our family is always beside us and none can deny the fact that it is much easier to face all the difficulties in life when we have our family beside us for support with their care and love. Our family helps boost up our self-confidence with the help of the selfless love provide by our family. Also, not to forget about the feeling of security that the family provides us with. The strength of the family does not matter here; it is actually the unity of the family staying together that gives a secure feeling that the family is going to stand by us regardless of anything. Our family loves and understands us which are extremely necessary. Just like other basic requirements a human being also has some emotional needs as well which is essential for the physical and mental happiness of a person. The family provides us with the required affection, understanding, and feeling of love, belonging and several others. Our family the only one that understands us the best and knows about us even the minute detail which gives us a feeling of satisfaction. Another great importance of family is that our family protects us from all kinds of external influences. The outside pressure or peer pressure might have a significant impact on the teenagers as well as the adults. This might create an external influence on the person and they might be forced to do something which morally not correct. This is where the family values come into play and prevent the person from doing anything incorrectly. This actually means that if one has a strong perception to differentiate what is correct and what is not due to the values that are inculcated in them by their family. Family basically gives us a center in this big earth. No matter wherever we go, we always have in our mind that we ultimately have to go back to our family at the end of the day thus providing a center and it means that we are not alone in this world. Family is of extreme importance for the raising of a child. Family plays a pivotal role in the development of the child in all aspects of life. The family comes together in assisting us to raise the child. Being in a family, one is in close contact with all its members which makes it much easier and convenient for the child to grow up in a healthy and happy way. Our family members take proper care of our child when we are ourselves sick or away from home and thus proving how important family is. Family comes to the rescue when we have to take any vital decision of our life such as changing of a job, buying some property etc. which might be very challenging if we had to do it all alone by ourselves. This is where family comes to our rescue in helping us to take the decision appropriately and quickly. Also, strong family values help the individual to make correct decisions in life. Families are extremely important to make us who we are. They help us in providing with the first steps in education and instilling in us the moral values. Our family helps us in the building up of our personality and beliefs for the future life. Ultimately, it is our family that shapes us and make us who we are today.